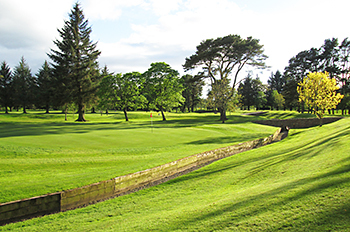 Founded in 1903, Deeside Golf Club established a full 18-hole course for its members within a year of its formation, once land became available to expand the inaugural 9-hole layout. Further land was acquired in 1947 and 1969, allowing the club to create an additional 9-hole relief course and this made its debut in 1984. A decade later, architect Robin Hiseman entirely remodeled the property, reconfiguring the 27-hole layout into a more purposeful golf complex. By the time the club’s centenary came around, the construction of a new clubhouse was in full swing and this new facility was unveiled to the membership in December 2004. The Haughton course begins with a par three, one of five short holes on the card. The right doglegged 7th is a very difficult par four, measuring all of 490 yards from the back markers, and it’s no surprise that this hole is rated stroke index 1. The 330-yard 9th may not be challenged by length but it requires a dangerous approach over water to the green. On the back nine, the par five 13th (”Combine”) is a beast of a par five, doglegging sharply to the right off the tee. In contrast, the 282-yard 17th (“Beidside”) offers a chance of picking up a birdie before heading up the long par four 18th (“Doctor”), where the home hole veers to the left, just before the green. The remodeling project started in the mid-1990s. At that time, Deeside had its old 18-hole course plus a 9-hole course that was physically remote from the clubhouse, underdeveloped and usually deserted. The club wanted a 27-hole facility with both 18 and 9-hole courses starting and finishing close to the hilltop clubhouse. This involved a total rebuilding of the old 9-hole course (where holes 2 to 12 are now) and the redesigning of several holes within the old 18-hole course to form the new holes necessary to connect both new courses back to the clubhouse. Phase 1 started in 1996, with the building of new holes 3 to 13 on the land of the 9-hole course. Play on the old 18-hole course was unaffected. Phase 2 commenced in 1998 with the building of new 17th and 18th holes for the main course and a new 1st and 9th for the new 9-hole course. There was quite a bit of disruption to play during this time before the new 27-hole project was opened around 2001. Not very long after that, a plan was devised to relocate the clubhouse down to the old 1st green. This meant that the brand new 18th, plus the brand new 1st and 9th holes were no longer required! This was a period of great division within the club and several long standing friendships were severed. The plan went through, the new holes were bulldozed and the course redesigned again (I wasn’t involved) to take account of the new clubhouse position. Admittedly it is a very nice clubhouse, but I've always wished we could have done the 27-hole redevelopment and the clubhouse relocation simultaneously. It would have saved an awful lot of effort and heartache. In the decade since the 'new' Deeside was completed it is great to see that it is growing into its new skin and with each passing year, the once stark contrast between the old and the new holes becomes less distinct. It is a fine golf club and a lovely place to relax and unwind. The new clubhouse has one of the finest outlooks in golf, over one of the strongest finishing holes in Scotland. There is no mistaking that Deeside is a quality golfing destination. Driving towards the course you encounter a very impressive driving range followed further on by a pristine practice putting green which sits adjacent to a very well appointed clubhouse. It also boasts 2 courses, T he Haughton, which was the course we were playing and the 9 hole Blairs course. The opening hole of the Haughton is charming and testing par 3 this, not surprisingly, is followed by numerous quality holes. I particularly enjoyed the 9th, which requires a good drive over water and a very testing 2nd shot to a very tight green. For me the course comes to life from the 12th onwards, the 12th being a really good par 3. The 13th and 14th are terrific holes the former, a par 5, left to right dog-leg, which narrows through an avenue of trees. The 14th is another cracking one shotter over water and guarded by strong bunkering. The wonderful 18th brings you home to the elevated clubhouse which provides panoramic views over the course. Deesisde has every right to be very proud of the service it provides with its choice of two courses, wonderful practice facilities and quality post round food, it is not difficult to comprehend why so many golfers in the area want to make it their club of choice. MPPJ. Respondents to a recent Top 100 survey of North East golf courses alerted me to the golfing merits of the Haughton course so it was only right that I had a look around when I was in the Aberdeen area over the last couple of days. The first thing you notice at Deeside is the very impressive, modern clubhouse which, despite being constructed over a decade ago, looks absolutely brand new. I’m told there’s a current five year waiting list to join Deeside, so there’s certainly no shortage of golfers willing to buy into a very chic golf club that already accommodates over a thousand members. The course is largely laid out on a river terrace of the Dee so the terrain is pretty flat, with several ponds and ditches dotted around, adding to the visual interest. The opening and closing holes are very good, playing away from then returning to the imposing clubhouse, with the 189-yard 1st plunging down to the green from a very elevated tee position and the 457-yard 18th bending left around a small pond to the home green. In between these holes, there‘s plenty of solid golf to be played on the Haughton, evidenced by a standard scratch mark that’s two strokes more than the par of 70 from the championship tees. Many of the fairways dogleg left or right to heavily-bunkered raised greens, some of which are multi-tiered, such as on the “L”-shaped 7th and pond-protected 9th. The best stretch is reserved for the older holes on the property, starting at the par five 13th, where the fairway crosses a prominent ridge (that once marked the bank of the river) as it kinks abruptly right to the green. It’s followed by a terrific par three (played to a raised green that sits atop another small rise) before the routing swings back via a narrow, tree-lined corridor to the 15th green lying on the other side of the ridge that was crossed two holes earlier. In an area where world class links layouts dominate the ranking lists, good inland courses like Deeside’s Haughton are often overlooked. Despite that observation, I suspect the course just might feature more prominently in the North East Best in Region chart when it’s published later this year.